Ji-Yong (David) Chung is a patent attorney and partner at Snyder, Clark, Lesch & Chung. David.Chung@snyderllp.com. A bit off-topic, but related, going to CBMs and R.36. Dennis Crouch has made an issue of significant number of R.36 affirmances being issued, where opinions would be expected from an appellate court. There is a Rule 36 affirmance in the following case: 16-2163, 16-2164 (Integrated Systems Inc. v. Travellers Lloyds of Texas et al. ), arising from CBM201400186 and CBM201400187. Having read through the first of the CBMs from the PTO I listened to the oral argument. Petitioner attempted to argue the claims were not directed to “abstract ideas”, in the face of much skepticism from (I think) Judges Dyk and Reyna. When the Respondent’s turn came, Judge Moore raised the issue of whether, in view of “Unwired Planet”, there was standing for CBM review in the light of the language of independent claim 1 in particular. The discussion was lengthy, with all panel judges involved. One might have expected that, once the judges had met in conference and decided the disposition of the case, an appellate court would ensure that an opinion was produced, covering the issues discussed at considerable length in the oral argument. That is surely their job. Please post the claims at issue so we can have a good laugh. By the way: the only thing amusing about the cartoon is that it serves as an unintentional reminder of how dense many patent attorneys choose to be when their favorite flavor of marsh bottom is running low. Is anyone out there confused about the roles that “conventionality” and “abstraction” play in subject matter eligibility determinations? Just ask. wherein the first computer system is further adapted to transmit the second file over a second communications channel to a third computer system. An application on running smith.mybusiness.com gets the user to fill in an electronic form, parses the information, and then sends some proper part of the information in an electronic file to jones.yourbusiness.com and some other distinct proper part in an electronic file to robinson.herbusiness.com. Claim 11 expressly refers to a “health insurance claim form” and Claim 30 expressly refers to “an insurance company”. The patent owner belatedly sought permission to delete these claims, and permission was granted, but the PTO argued, and the CAFC panel presumably accepted, that if the petitioner initially had standing, there was no legal requirement in the statute for the petitioner to retain standing throughout the action at the PTO. Send the first file to computer 2; send the second file to computer 3. Wowee zowee. Super techno stuff. Claim 11 expressly refers to a “health insurance claim form” and Claim 30 expressly refers to “an insurance company”. Because nobody could figure out how to do with it banking data until Wilbert Mckanikov figured it out in 2013. Completely different, structurally, from fields that aren’t identified. Are you trying to make an inherency argument? You tell me. Am I making an inherency argument? If you believe so, prove it to everyone else. Good luck. Seems to me that I’m simply recognizing the fact that there is no patent-eligible distinction between a “field” that is identified as “address field” versus a “field” that is “the first field.” Both are ineligible subject matter. Likewise, a claim describing a prior art pipe and additionally reciting a non-obvious agreement between me and a third party that restricts my rights to use the pipe is also ineligible. I’m sure this is incredibly confusing for you and your deep, deep thinking and oh-so-serious clients. But you just go ahead and take the money and run, “anon.” It’s what you do best. Run, run, run. Filing date: May 21, 2006. It never ceases to amaze me how long it takes inventors to consciously realize what it is that they invented. In the current instance, it took over a decade, though there is a long sequence of patent applications or patents that claim priority from patent applications earlier in the sequence. Judge Moore raised the issue of whether, in view of “Unwired Planet”, there was standing for CBM review in the light of the language of independent claim 1 in particular. The discussion was lengthy, with all panel judges involved. One might have expected that, once the judges had met in conference and decided the disposition of the case, an appellate court would ensure that an opinion was produced, covering the issues discussed at considerable length in the oral argument. That is surely their job. Except in this instance their job is to ignore Unwired Planet because it’s a travesty and admitting that would only compound the embarrassment. They don’t need to mention Unwired Planet. Claims such as claim 1 above fail 101. A short paragraph, or even a couple of sentences, giving reasons along the line of the judges’ comments during the petitioner part of oral argument would do no harm. Notwithstanding Judge Moore’s issues, the patent included two claims, 11 and 30 that allowed standing for CBM review. No harm in pointing this out in a sentence or two. And the respondent’s later request to delete these claims did not moot the CBM review. Is there precedent for that? Suppose that, with no opinion in this case, a similar case came up before a panel including, say, Judge Newman and Judge O’Connor? Whatever the two of them decided would probably go in an opinion and set a precedent that would be binding on the CAFC unless they decided to take the matter en banc. They don’t need to mention Unwired Planet. Claims such as claim 1 above fail 101. But under Unwired Patent “likely to fail 101” isn’t the test for establishing that a CBM proceeding is properly instituted. The test is whether the claim expressly refers to conducting business or processing financial transactions. According to the travesty that is Unwired Planet, claim 1 should not have been subject to CBM review, period. I cannot post the image unfortunately, but John Tenniel’s image says it all. There are no 101s in IPRs. oops, that should have been CBMs. Yes, only prior patents or publications. Not 101, 112, on sale, public use, etc. But the exchange with Alice is clever. This is very relevant to patents because the massive, massive, amount of free capital has created these situations where essentially the mark cap of companies like Tesla is a vote for the future and it provides the availability of capital to the company. So, the stock market is oddly acting as venture capital. I think this is something new. “The Silicon Valley car company is rushing to launch its mass-market Model 3 sedan in the second half of 2017 and quickly ramp up its factory to reach a production target of 500,000 cars per year in 2018. Last year it sold 76,230, missing its target of at least 80,000 vehicles. By comparison, GM sold 10 million cars and Ford sold 6.7 million”. Have so-called Growth “Investors” always been this crazy, or is it a new thing? August 14, 1998: Global Crossing goes public @ $19 a share, EV of $3.8 billion. February 16, 2000, Global Crossing is $61.82, EV $47 billion. February 2002, Global Crossis is trading at 6 cents, EV $70 million. It was a real company, with a real network that cost $14 Billion real dollars to build, just as surely as Tesla is a real company makes a terrific, real car. But people never learn: investing in securities is not simple, and even enormous success may not translate into earnings for shareholders, which, at some point, must be the point of owning securities (if one is not simply gambling on a roulette wheel). Nothing wrong with gambling, but good gamblers know when to cash in their chips, and these stories always leave the wrong people holding the bag: pension funds, governments, non-profits, and individual suckers. All of the entities that tend not to move quickly when the tune changes. Indeed, the superficiality of financial investigation by many stock purchasers is in contract to the due diligence, including patent evaluations, more typically done by professional venture capital investors. But not entirely OT in view of the similar lack of due diligence by this cartoon’s, and many other, date-seekers. Even more costly, all the companies that get encouraged to file expensive lawsuits or expensive lawsuit litigation defenses w/o first getting an independent second opinion of their odds and cost exposures. I believe it was Thomas Edison who first really mastered the selling of stock in various companies he set up as a large source of venture capital for promised future products [several of which failed]. Name recognition seems to be a major factor. Indeed Paul, knowledge is hard won…. 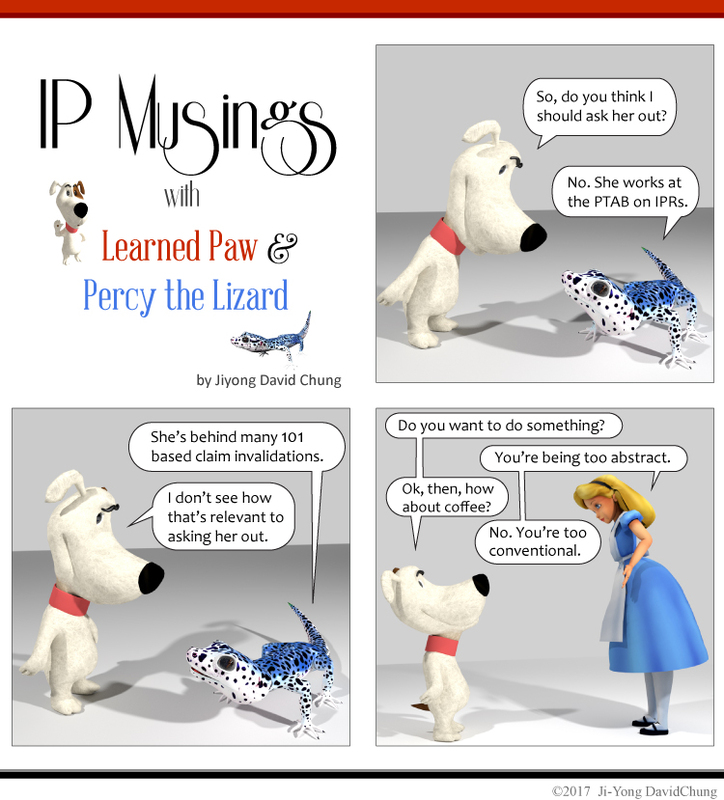 Yes, this is the typical of the level of discourse regarding 101 for most patent attorneys. It’s sooooooo complicated and confusing after all. The “experts” told us so. I particularly enjoy the implied interspecies erotica. Made milk come out of my nose.